The mysterious disappearances of King Arthur and Wales’ foremost rebel Owain Glyndwr have a remarkable similarity with that of one of Armenia’s greatest heroes, according to a leading Welsh clergymen. Canon Patrick Thomas, the Vicar of Christ Church Carmarthen and Chancellor of St David’s Cathedral, is the author of a highly praised new book which finds numerous similarities between Wales and Armenia, which until 22 years ago was a republic within the Soviet Union. On Monday From Carmarthen to Karabagh will be launched in the Temple of Peace and Health in Cardiff. In recent years close ties have been established between the two countries, prompting Canon Patrick to visit Armenia for the first time in 2005. He immediately fell in love with the eastern European country and kept going back, becoming increasingly aware of the parallels and contrasts between Armenia and Wales. His book has a unique structure: each chapter has an introduction, three sections focusing on related themes from Armenia and a final section that points out relevant similarities with Wales. In a section about Welsh and Armenian heroes, Canon Patrick writes: “Some heroes are meant to vanish leaving no known burial place. “Moses is an obvious Biblical example. In Welsh tradition two of our greatest warriors similarly disappear: King Arthur and Owain Glyndwr. “I was once rebuked by a Church of England clergyman for having described King Arthur as Welsh rather than English in one of my books. ‘Who do you think he was fighting against, then?’ I asked. The burial place of King Arthur is a mystery, as is that of Owain Glyndwr. “The legend that haunted the popular imagination told of an encounter between Owain and the abbot of Vale Crucis,” writes Canon Patrick. “The latter had gone out in the early morning mist to say his prayers when he met the fugitive hero. Owain rebuked the cleric for getting up too early. “The abbot replied that Owain himself had risen too early by 100 years. From this grew the feeling that Owain (like Arthur before him) would one day return. He too was said to be sleeping with his warriors in a cave – perhaps one of those in which he had hidden during his years on the run. “In Armenia a similar role was given to Pokr Mehr, the last of the wild heroes of Sassoun, whose exploits form a part of the national epic. Canon Patrick also writes movingly about the murder of more than a million Armenians in Ottoman Turkey during the First World War – an event recognised officially as a Holocaust by the National Assembly, but not by the UK Parliament. The book has been praised by the Archbishop of Canterbury, Dr Rowan Williams, who writes in a foreword: “Patrick Thomas’ distinctive voice – learned, thoughtful, compassionate and witty – has become more and more widely known and appreciated through his writings about Wales and the imaginative legacy of Christian faith in Wales. “Here he turns to another subject, though without at all leaving behind his characteristic rootedness in the local realities of Carmarthenshire. “His love affair with Armenia began, as he tells us, some six years ago, and it has worked itself out through many visits, through passionate advocacy and through a deep immersion in the culture of this extraordinary nation. “Unsurprisingly, he finds analogies with another small and mountainous country, jealous of its language and its heritage. 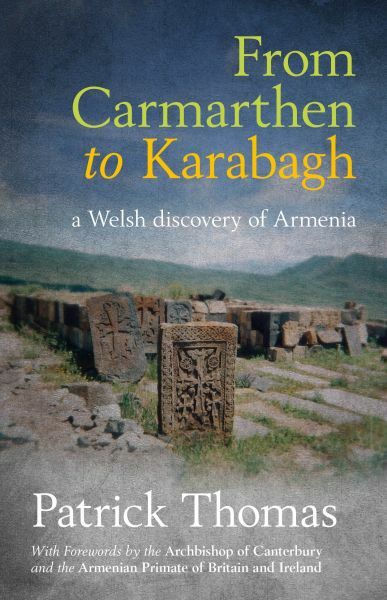 From Carmarthen to Karabagh by Patrick Thomas is published by Gwasg Carreg Gwalch at £7.50.